Thousands of people for the Families Belong Together march! We have two sons. Sebastian is 3, Francisco just 5 months old. I cannot imagine the emotional trauma my boys would experience if they were to be separated from Vanessa and me. But that’s what’s happening at our border—forced family separations, denial of due process, imprisonment of kids and parents. To be silent while this takes place in our country is to be an accomplice. 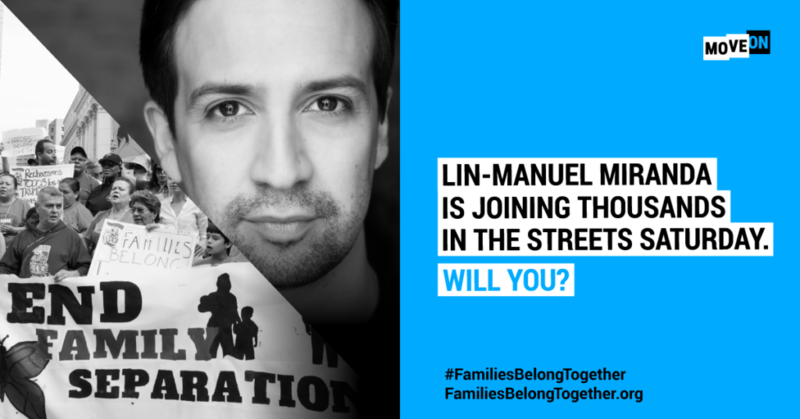 I’m headed to Washington, D.C., this Saturday, June 30, to join tens of thousands of people for the Families Belong Together march. It’s one of more than 700 events around the country taking place where, together, we will raise our voices loud and clear and call for an end to family separations and the suspension of due process at the border. Click here to find the event closest to you—and please, please, please invite five friends to join in as well, by forwarding this email to them and posting about this day of action on Facebook or Twitter. Grab your neighbors, your extended family, and everyone you see and bring them along on Saturday. I am devastated by the news that keeps coming out. I’m heartbroken that this is being done by our government intentionally and in our name. This is a horrific strategy to terrorize families and criminalize immigrants, instigated by the same people who have ended protected status for people from countries wrecked by natural and political disasters. They have moved to ban Muslims from entering our country. They have said that domestic abuse isn’t a reason to grant asylum. But even as we experience this heartache, I am also blown away by how we have come together at this moment. We are showing up to support these families by the thousands. Please RSVP to join me on Saturday in Washington, D.C., or to join the event closest to you—and then tell everyone you know to take part. We all need to be there so spread the word, post about this day of action on Facebook and tweet about it—and share this link: familiesbelongtogether.org, where 700+ events are listed. There’s one virtually everywhere: in all 50 states, D.C., my beloved Puerto Rico, and more than 350 congressional districts! People of good conscience from across the country and across the political spectrum agree on this: Families belong together. We’ve got to make this clear to our government: Reunite families. Close family prison camps. And hold the abusers accountable. On Saturday, I’ll be speaking out. Will you join me?